As we drove across the border – let’s not beat about the bush, there wasn’t a border, there was a Spanish police car parked at the side of the road with two policeman hanging around next to it, I thought they were just doing a routine check…. no signs, nothing. I am showing my age now aren’t I? – anyway, as we drove across the border I switched the sat nav from French to Spanish and we started speaking in a new language which has been named ‘Sprench’ …. I am sure it will get better over the next few days, but it is odd how the mistakes that we both make are now using a French word by mistake rather than a Spanish one, whereas 6 months ago it was the other way round. We headed towards a campsite just outside San Sebastian at the top of a hill called Camping Igueldo (16.50 euros without electricity). As we drove up the hill we were both thinking the same….. do we walk into San Sebastian or Cycle? Either way it is going to be hard coming back up. The campsite said it was 4.5km into San Sebastian, it was actually nearly 7km… and nearly 300m up. 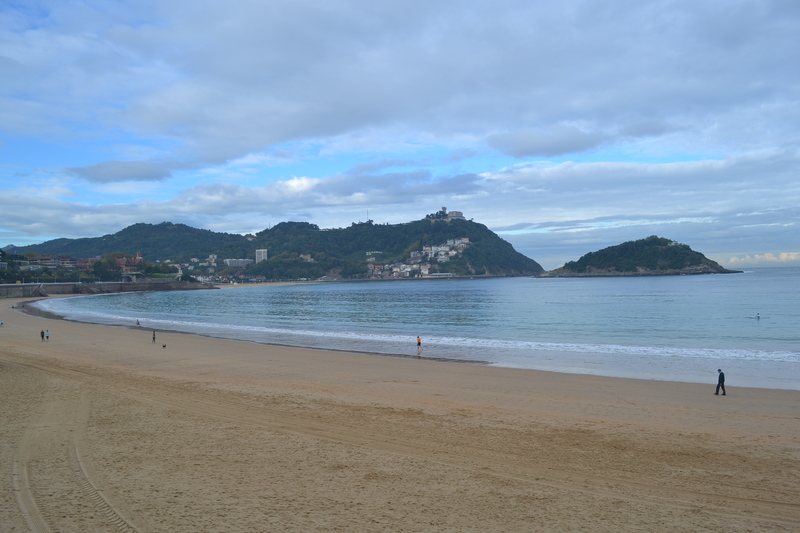 We have been to San Sebastian before about 7 years ago whilst we were living in Barcelona and whilst here we did actually walk to the castle that sits on top (not as on top as the campsite, but most of the way up) of the hill… if nothing else we get good views! After a good nights’ sleep we decided to cycle down into town (very quickly) and have a walk around. The old town is really lovely and is pretty much made up of pincho bars and cafes. For those of you who don’t know what Pinchos are, they are small tapas/finger food of about two bites. Most Pinchos come in the form of a slice of bread/roll with something on top … perhaps stuffed pepper, tortilla, prawns or jamon but generally they are quite tasty. North of Spain is known for its Pinchos (also spelt with an ‘x’) and people will eat a couple mid-morning to tie them over until lunch (at 3pm), lunch on them, or eat them in the evening in a bar with friends. After a coffee and a good look around we returned to the bikes for the ride home…… it was a long hard hill but it was aided by the beautiful views of mountains on one side and sea stretching out on the other, but we got there …. me slightly slower than Keith, but still, cycling all the way :). I am not sure if the hard work up the hill had anything to do with it, but the showers on the campsite were the best we have found yet – clean, lots of hot water, spacious, lots of space to hang your clothes up without getting them wet ….simple things eh?